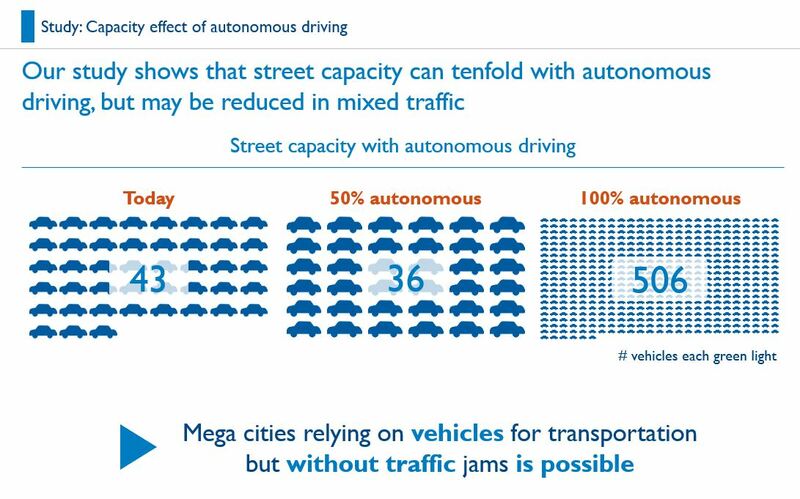 Arthur D. Little conducted a real-world simulation analysis that demonstrates that switching to totally autonomous vehicles dramatically reduces urban congestion, but that a mix of human and robot drivers actually increases traffic jams. The micro-simulation was based on a major intersection in Frankfurt am Main, Germany, that is notorious for its large evening traffic jams. This five lane highway includes two lanes turning left and one to the right, has a 80 km/h speed limit, and is controlled by a traffic light. The simulation measured the impact of three scenarios on traffic within the two central lanes - 100% human drivers, a 50/50 split of human and robot drivers, and 100% autonomous vehicles with adapted traffic rules.